When I began working out at Christie's I felt I was fit. I didn't realize how "fit" I could be. I have been challenged and realized I can do anything a 20 year old can do. And I have several years on them!!! Just ask me now how I feel about myself. I would highly recommend Christie and all the people at Body Essentials. In January I decided to take charge of my health and well-being. I needed to sign up for an exercise program and restart my healthy eating. I found Body Essentials on Facebook and they were offering both a fitness and healthy eating program for 8 weeks. 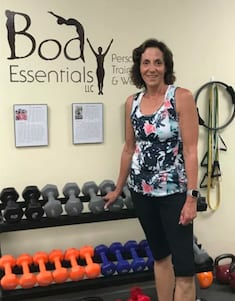 Some of my friends were engaged in Body Essentials and their programs worked so I decided to contact and soon after, I was contacted by Christie and before I knew it I was meeting with her about finding a fit. I was immediately comfortable with Christie and the studio is not a traditional gym. I signed up for a 28 Day Nutrition Kickstart and the 8 week fitness program. 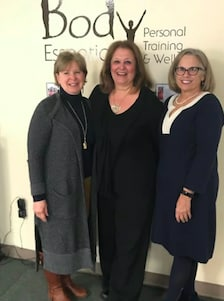 What I learned as a result was that it is not just about the number on the scale but about losing inches and overall well-being and how you feel physically as well as emotionally. I gained so much strength and mobility and lost a lot of inches and my nutrition and shopping habits have changed for the better. I am still learning but love it. I decided to continue my training after my initial experience. The support I have received from each of the coaches, Nicole, Maresa, and Christie is awesome. I got modifications when I needed, an extra push and a lot of support beyond my workouts and coaching sessions via facebook and text messages. Amazing ladies is all I can say. I have told many people about my experience with the team at Body Essentials and continue to encourage people to try them out. You will not be disappointed. They really care and it shows! After decades of no physical activity whatsoever, I realized I needed help. I had difficulty getting out of a chair, had pains in my hips if I sat too long and my largest paints were now too tight. Not being one to ever go to a gym, I realized I needed to do something before it was too late. I liked the concept of one on one training that Body Essentials had to offer, so I figured why not give it a try. The hardest part was walking in that door the very first time because I was embarrassed at how out of shape I was. I immediately felt comfortable and knew that this is the placed I needed to be. Christie kept pushing me but never more than I could handle. As each month passed I was getting stronger and stronger and she kept pushing me further and further. Now I feel l can keep up with the "best of them!" I actually love going to my one on one sessions so much, I started going to the group classes too, where I have met some great people. Thanks Christie for everything!! You gave me the push I needed, you showed me a way to find joy in exercising and how to believe in myself!! People connect with personal trainers for different reasons/goals. Earlier in my life, my goals would have been focused on "looking good" by having tight abs and burning off excess weight. Now, in my life, due to a diagnosed health condition, my goal is on maintaining core strength and physical flexibility to reduce chances of progression of the condition. Thanks to Christie's positive attitude and skilled repertoire of exercises, I am doing quite well. She helps me remain positive even at times when I am discouraged or fearful of my condition progressing. She listens carefully and cares deeply about meeting my needs. She tailors my program and also makes helpful suggestions and approaches to restore my strength and flexibility. Weekly, I leave her individual session with more confidence and hope. I also leave with a smile on my face after receiving a caring hug. Thanks Christie, from me, and from my entire family. Before I started working out with Christie at Body Essentials, I had slacked off my usual exercise regimen. My former gym closed and I was working long hours with little time to exercise. One day after weeding my flower gardens I could barely move and I knew I had to do something to get back on the right path. I began working one-on-one with Christie and also attending her classes. It didn’t take long before I was feeling like I was back on the right course. Thanks to Christie and Body Essentials I don’t think twice about doing all the activities I enjoy, and with no aches or pains. 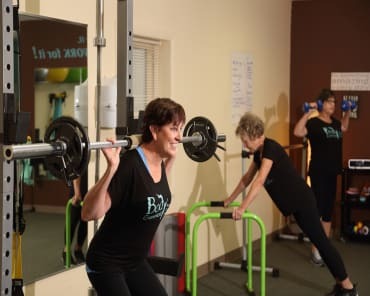 Her one-on-one sessions are tailored to exactly what each person needs, and her classes are small and personal and tons of fun, with new exercises being introduced all the time (and it isn’t just burly football players who can push a sled around!). I highly recommend that you check out Body Essentials in the Howe Center. Meet Christie and quickly see that her enthusiasm for exercise is contagious, and well worth your time! 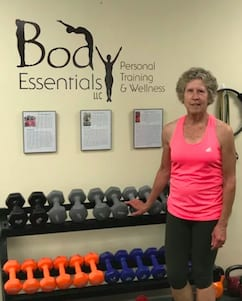 A renewed commitment to self, weight loss, improvements in strength, balance, and tone are all part of the Body Essentials experience. We appreciate the knowledge, professionalism and competence of the coaches and training philosophies in place including addressing pain points and limitations and providing modifications as needed for the benefit of each client. The holistic approach that is in place to support more than just the fitness but also the nutrition and general lifestyle strategies help keep us on track, off the couch and motivated to persist even on the busiest of work days. We have so much in the judgement free zone while making new friends and achieving a greater work-life balance. Try it, you will like it! Just do it! There is no comparison to a regular gym! Christie provides a holistic approach encompassing weight training, nutrition and stress management. As a senior, she studies my strengths and weaknesses. Her methods of motivation are positive and encouraging. I feel so much better. 14 months ago I was in a car accident that took away most of the “active” parts of my life. My physical therapist recommended I call Body Essentials and meet with Christie – best recommendation EVER! In the past my activity had been life, not an official workout or class with a trainer. After missing an entire summer of golf, walking my dog, and just plain moving freely, I felt I had nothing to lose and everything to gain! I met with Christie for an initial fitness assessment where she spent time with me and listened to my concerns about my back injury and what I wasn’t able to do physically because of it. I left the initial meeting feeling like I could, with hard work, regain my active life back! 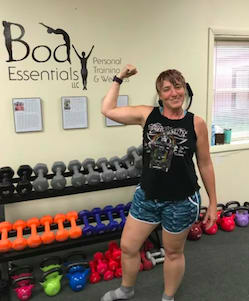 On my 46th Birthday I took my first class and went on to complete a 5 week (3x a week) Fall Fitness Kickstart where we worked to build up my stamina and my confidence. At the end of 5 weeks I set up a weekly semi-private personal training session and committed to taking as many classes a week as I could. It’s been challenging but I’m proud to say that over the last 3 months I’ve made almost every class (3 a week) plus my personal training session. 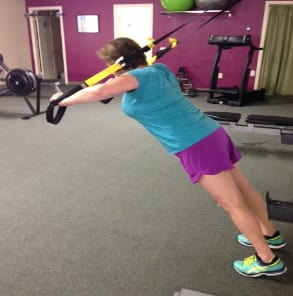 My mobility has improved and I feel stronger every class! I find Christie to be very knowledgeable, encouraging, and caring. She has a “can do” attitude that is contagious and has helped me see that with hard work and good worth ethic I CAN get back to being active. I’m excited to see where I could be a year from now! I started my workout journey with Body Essentials about a year and a half ago. And to be honest I questioned whether this was going to be yet another failed attempt at getting into shape. As soon as I started, I realized I made the right choice in choosing Christie. I was looking for a small studio setting that was attentive to my goals and needs. Also, I was looking for a trainer that cared about me as a person and listened to what I wanted. Her energy and passion for helping people was evident early on. Christie is always going above and beyond to make sure she is doing everything she can to make sure I succeed. 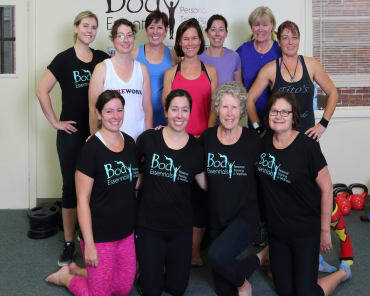 Body Essentials is a place that offers a fun and realistic approach to exercise. I thoroughly enjoy coming to my sessions every week because it's never boring. No two sessions are ever the same, which makes working out more exciting. One of the biggest lessons (so simple too!) that I have finally learned is that there are no short cuts if you are looking for long lasting results; you need to put in the time, you have to be willing to find the perfect balance that works for you (it is trial and error) and you have to be able to believe in yourself. If you are willing to invest in yourself and your health, Body Essentials is the place that will get you on the right path.